Can Sony's cloud gaming system succeed where OnLive failed? Netflix for games? It's been tried before, and it failed - badly. OnLive finally shut down its servers last week, but the cloud gaming dream is far from over. Sony's PlayStation Now follows the same principle, albeit with much-improved tech: games are hosted on remote servers, streamed over the Internet to your screen - but this time, there's a twist. Instead of PC-based technology and games, Sony has created bespoke cloud servers based on PlayStation 3 hardware, capable of running any game on the console's extensive library. The basic idea behind the system is simple: PlayStation Now offers instant access to a range of PS3 classics, and while the service only works on PS4 and Vita consoles, the nature of cloud streaming ensures that virtually any mobile device, set-top box or Smart TV is capable of receiving and playing PlayStation Now games. All that's required is a compatible controller - and an app from Sony, of course. In terms of actual gameplay, the absolute best-case scenario is a system where video quality and input lag is indistinguishable from playing a game on local hardware - the claim made by OnLive that the service palpably failed to deliver. The question is, can PlayStation Now succeed where its spiritual predecessor failed? PlayStation Now is available to all US gamers right now, with a UK beta test - which we participated in - currently in progress. At the time of writing there are around two dozen games available from a rolling selection where titles are seemingly swapped out randomly. The beta is free, but there is a business model in place for the finalised US service. In addition to a a series of subscription offerings allowing access to the entire library of titles, there are also rental options available for individual games, covering periods of up to 90 days. Ascertaining whether your set-up is up to the task of handling PlayStation Now, there's a connection test option available, that also runs before you start each game, allowing you to see if there's adequate bandwidth and low enough latency to provide a smooth experience. If your network cannot support 5mbps of data throughput, or your ping to the PS Now servers is too high, a warning message is displayed on-screen and you're locked out of the PlayStation Now system. For a beta, the UK service is very solid: our connection test never failed and the line never dropped. We can assume that all the experience Sony's cloud team derived from the US experience has carried over to the UK version. 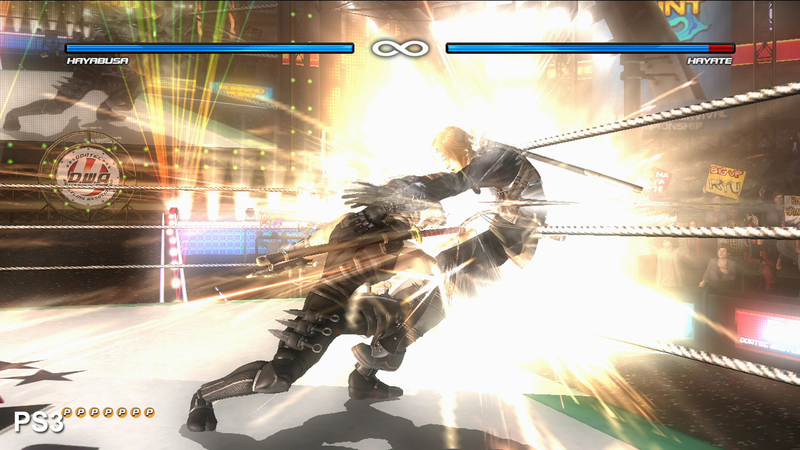 Local gameplay on PS3 compared with the cloud-based equivalent on PlayStation Now. Use the full-screen button and full HD resolution for the best experience. At the technical level, gameplay is transmitted in the form of a 720p h.264 video stream running at 60fps (even if the game itself operates at a lower frame-rate), and as expected, visual quality is a bit of a mixed bag bearing in mind the modest 5mbps of bandwidth. 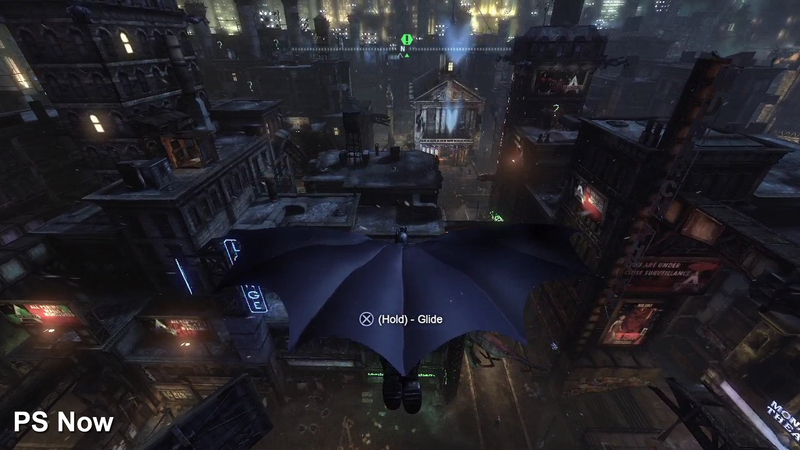 Slow moving games with a more limited colour palette - like Batman: Arkham City, for example - look pretty good. 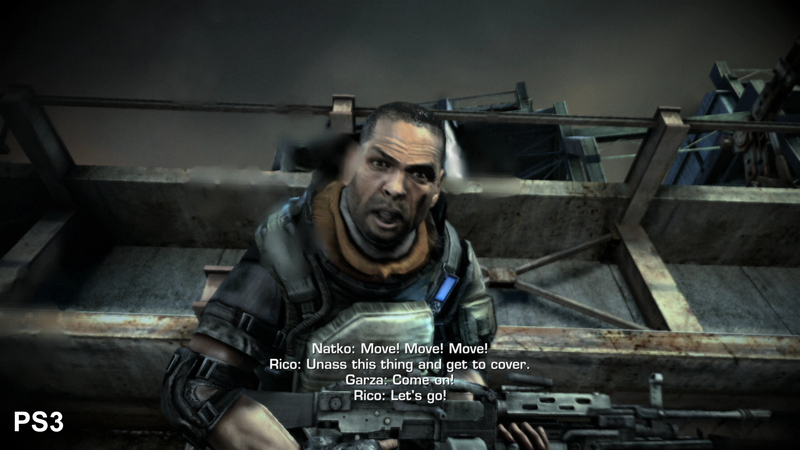 Similarly, the heavy use of post-processing in more gloomy titles like Killzone 2 also works well in partially concealing the compromised nature of the video stream. There's a reduction in image vibrancy, and viewed up-close there's a noticeable blur, but in typical living room conditions, the overall effect is decent. However, the problem in applying a one size fits all approach to video encoding is that quality varies according to content. 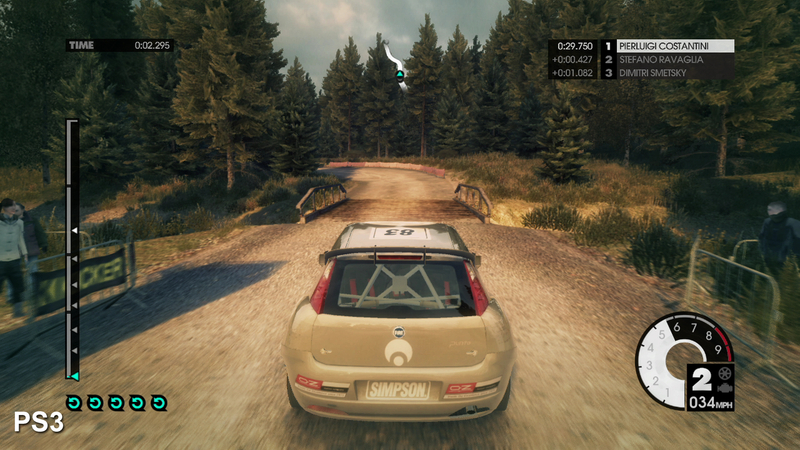 With brightly lit environments and fast motion seen in racing games like Dirt 3 and Motorstorm: Apocalypse, the video encoding doesn't cope quite as well. Image quality is generally workable, but it's also inconsistent with some scenes appearing cleaner with reduced levels of macro blocking than others. In the case of MotorStorm Apocalypse, artefacts visibly began cropping up in slower moving scenes before subduing a few moments later, suggesting that there's only so much that can be done with 5mpbs worth of bandwidth without introducing variances in video quality. 60fps titles are where PS Now's video encoding capabilities are really put to the test - and an area that could really use more bandwidth to deliver better results. These faster titles provide more motion for the encoder to contend with, but no additional bandwidth to cope with the extra load. Dead or Alive 5 is a good case in point - its combination of high frequency detail, fast motion and rich colours sometimes proving overwhelming for the paltry 5mpbs of bandwidth available. 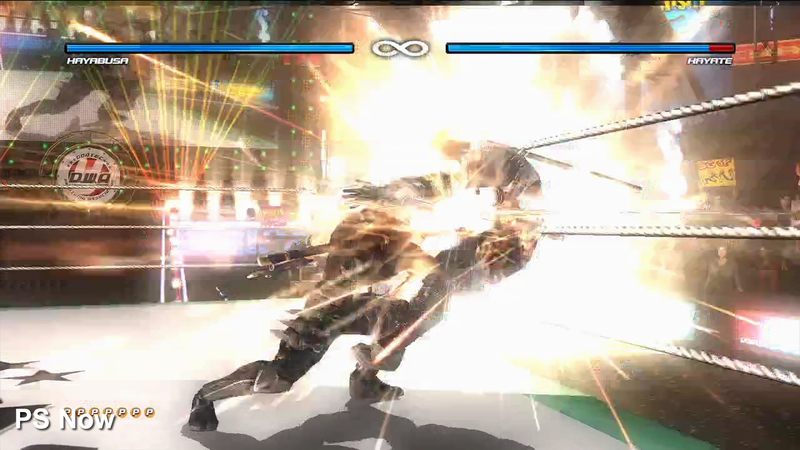 Performing combos and dashing across the screen results in a sea of artefacts that scrub away clarity and detail. As things stands, video quality is a mixed bag. There's a clear improvement overall compared to the standard set by the launch version of OnLive, but a little more bandwidth could go a long way. We can see why Sony settled on the 5mbps standard - it ensures that PlayStation Now runs on more internet connections - but at the very least we would like to see a scalable bandwidth option, so those with better connections can get a better experience. Introducing this option made made a big difference to OnLive's image quality woes back in the day. At the most extreme end, we recently saw Nvidia's GeForce Grid stream The Witcher 3 at 1080p60 using 30mbps of bandwidth. Not surprisingly, the results were phenomenal. 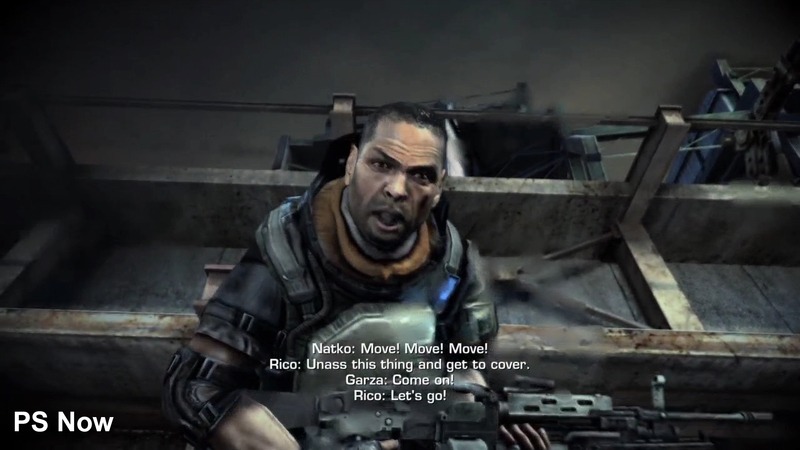 60fps titles appear respectable in scenes with little movement, but fast motion shows how the compressor struggles to encode the video stream, introducing noticeable macroblocking on-screen. 2D games running at 60fps hold up rather well. 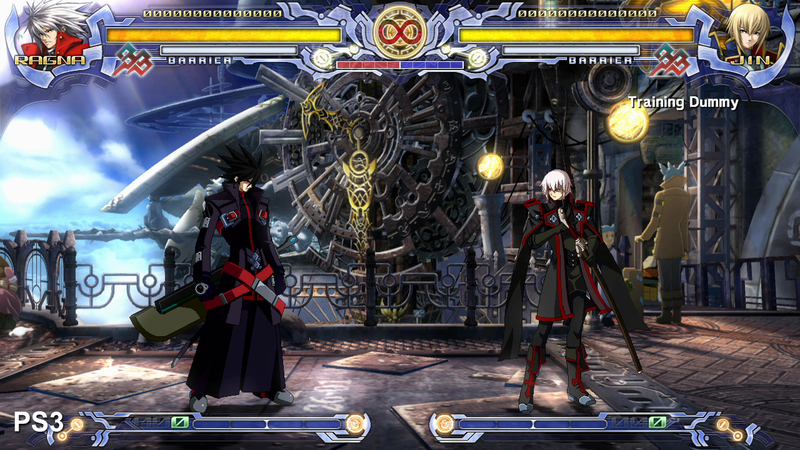 BlazBlue appears softer on PS Now, but compression artefacts are kept under control fairly well. 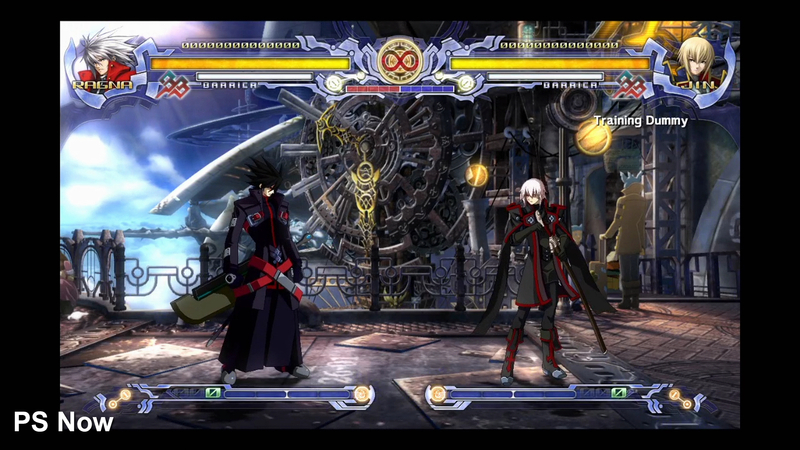 Opening sequences are full screen in BlazBlue - however, on PS Now the action is bordered during matches and in the game's anime intro. Slow moving scenes on PS Now streaming come much closer to the local experience. The main differences here are reduced colour saturation and a light fuzziness around fine details. Compression artefacts are more noticeable in bright, high constrast scenes. Darker areas help to hide the softer and more fuzzy presentation of PS Now titles. 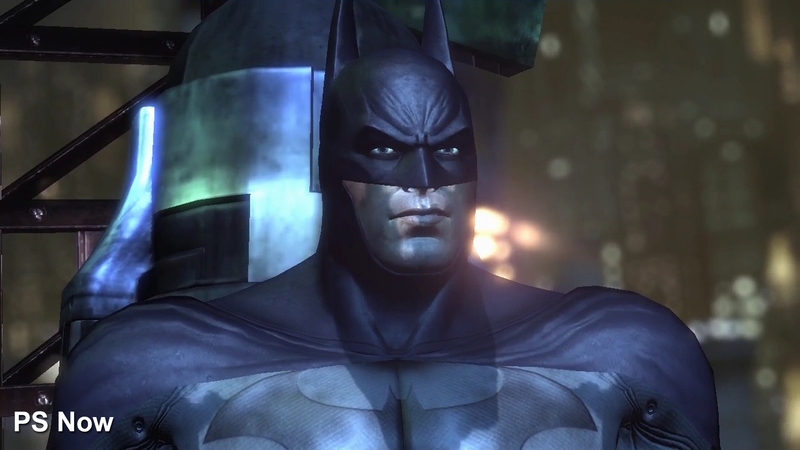 Batman works particularly well on the service for this reason, as does Killzone 2. Moderate levels of motion introduce a mild blurring effect to the video stream on games like DiRT 3, removing finer details from the presentation. 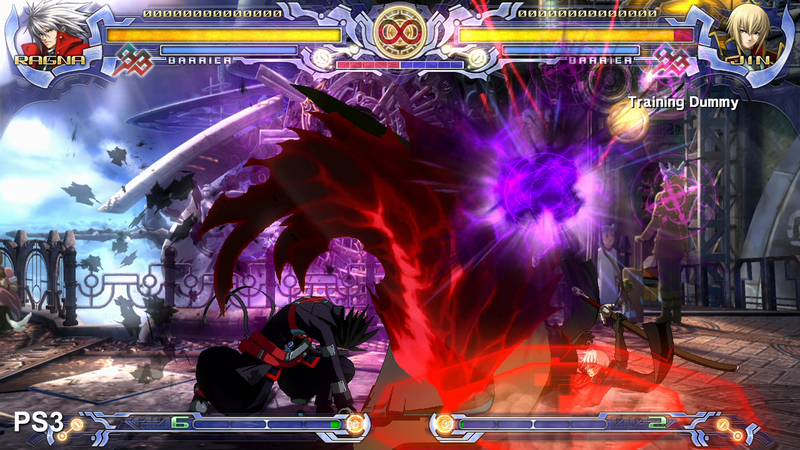 High contrast scenes and fast-paced gameplay show up the limitations of using a compressed video signal to deliver gameplay. 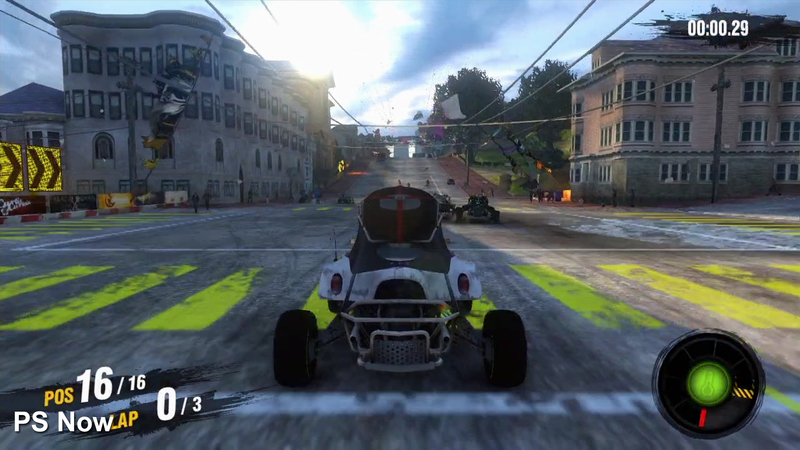 In this shot we see how MotorStorm is visibly cleaner running on a PS3 console locally compared to PlayStation Now. PlayStation Now: what's the lag like? Video quality is important but crucial to the experience is latency - effectively the time taken from inputting a joypad command to seeing it play out on-screen. Even playing locally, every game has its own level of input lag: usually in the region of 50-80ms for a 60fps game and anything from 80-150ms for a 30fps title. On top of that there's display latency too. This can vary immensely depending on the screen. The challenge with cloud gameplay is that further delays are added between button press and on-screen response. Joypad commands need to be beamed over to the server, where game processing takes place, followed by video encoding, transmission over the internet and client-side decoding. Our previous analysis with first-gen cloud systems OnLive and Gaikai put end-to-end latency between the 150-300ms mark, with Gaikai occasionally able to deliver an impressive 133ms response in Bulletstorm. That's a major achievement, on par with local latency on the Xbox 360 version of the same game. However, the experience on both systems was fairly inconsistent with varying levels of input lag that could compromise controller response. PlayStation Now is an improvement, but it is similar in that the quality of the experience is reliant on network conditions. Initially, trying out Dead or Alive 5 and Killzone 2 we were confronted with a noticeably amount of input lag that distracted us from playing both games. Killzone 2 came across as barely playable, with incredibly heavy controls that were slow to respond, while in Dead or Alive 5 we had to input button presses on the Dual Shock 4 about half a second before we saw the attack appearing on screen. However, that turned out to be a one-off experience, with PlayStation Now operating much more impressively in later sessions - although we should stress that we did everything to ensure best possible performance: we used an Ethernet cable to connect directly to the router (eliminating potential WiFi lag) and we used a 40mbps fibre-optic internet connection, way beyond the base requirements for running the service. Stress-testing latency, we initially opted to use Ultra Street Fighter 4 - a title that performed extremely well on Nvidia's GeForce Grid system, and a game we'll return to when we assess the upcoming Shield console. First impressions were mixed. We could play the game just fine, with no problems in executing dragon punches, fireballs or any other special move. However, carrying out those all-important combos seemed to come down to pot luck. Street Fighter titles operate with really tight timing, and whether it was down to the additional latency or the slight variances in response, PlayStation Now simply couldn't deliver. To get a handle on actual latency, we pointed a 120fps camera at an Asus gaming monitor, filming the amount of time taken between pressing a button on the Dual Shock 4, and the resulting action occurring on-screen. Using the PS3's XMB as a reference for input lag, we found that the Asus screen added on just one frame of latency in our 120fps captures, 8.3ms. Factoring out the display lag, Ultra Street Fighter 4 handed in a 150ms latency - about 80ms slower than the game running locally. 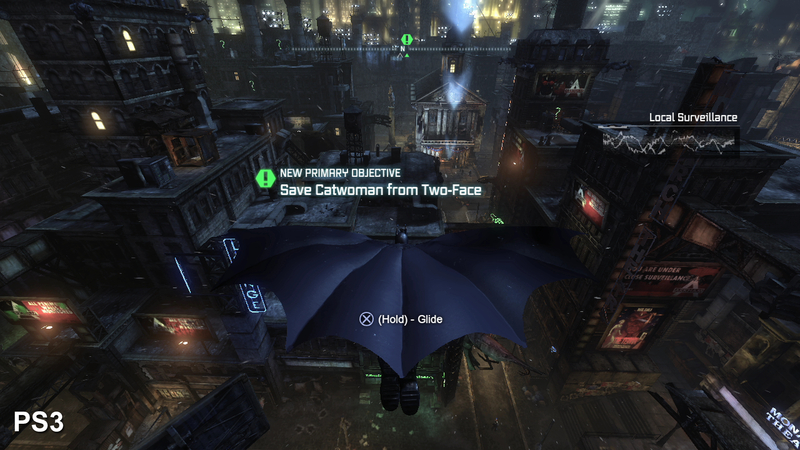 Frame-rates are generally identical across the same titles when played across PlayStation Now and locally via a PS3 console, with tearing and dropped frames appearing in demanding scenes. Here we take a look at Killzone 2, Batman: Arkham City, Saints Row 3, MotorStorm Apocalypse and Dirt 3. Curiously, despite the additional latency, it's the slower-paced 30fps games that pay dividends on PlayStation Now. Latency increases here see input lag travel up closer to the 200ms area, which we would normally consider unplayable, yet Uncharted 2 and Batman: Arkham City are both solid experiences. We rather enjoyed returning to the Naughty Dog epic to the point where we made it through four chapters of the game, never feeling that the controls were holding us back. Even driving games like MotorStorm Apocalypse and Dirt 3 were enjoyable - yes, you can feel the lag, but you can adjust and the experience works. However, we also tested the same games on a living room plasma TV, where the experience didn't feel anywhere near as good - clearly additional display latency in the HDTV was compromising the experience. Latency is perceived differently by everyone - in our experience, there's a threshold between a game feeling 'right' and 'wrong' and simply changing displays added the extra lag that made us cross the line between a good experience and one that fell short. We can safely assume that Sony's PlayStation Now server-side infrastructure features an improved storage solution over the 5400rpm hard drives used in the standard PlayStation 3. This results in an actual upgrade over playing the same games locally on PS3: we saw noticeably improved texture streaming in Batman: Arkham City, while loading times are faster across multiple titles. Indeed, loading times on average are around 25-50 per cent faster on PS Now, with MotorStorm: Apocalypse, Dead or Alive 5 and Killzone 2 seeing the largest improvements in the title we tested. There are other benefits to the cloud infrastructure too: mandatory hard drive installs clearly aren't an issue (everything is already installed and ready to go) and there's no need to download patches or system software updates. In this regard, PlayStation Now offers the kind of 'plug and play' experience that is basically a thing of the past these days, but which used to be a core advantage of the whole console concept. However, those looking for other benefits are likely to be disappointed - Sony's cloud servers offer no real technological improvements over a standard PS3 console. Cloud to console analysis over several games reveals that performance on PS Now is essentially identical to running the game on local hardware. In like-for-like tests, frame-rates are impacted at similar points during gameplay, with judder and screen-tear creeping in when engines are heavily taxed - with performance profiles matching the standard console. Out of all the games we tested, Dirt 3 was the only title where we noticed a tangible difference, with occasional extra pockets of uneven frame delivery and tearing. Curiously we noted that a continuous tear right at the very top of the screen in this game was relocated several pixels down on PS Now, suggesting that internal timings were running late by a few milliseconds - something similar is also seen on MotorStorm Apocalypse. However, in all other cases, there are no surprises. PlayStation Now is PlayStation 3 - even the system software prompts including trophies and PSN sign-in notifications are the same. There's a really simple principle that has driven the cloud gaming concept up until now - PC technology is utilised to run games at 60fps, resulting in an approximate input lag reduction of 50ms compared to the same game running at 30fps. That latency saving is then offset against encoding video, transmitting it over the internet and decoding client-side. 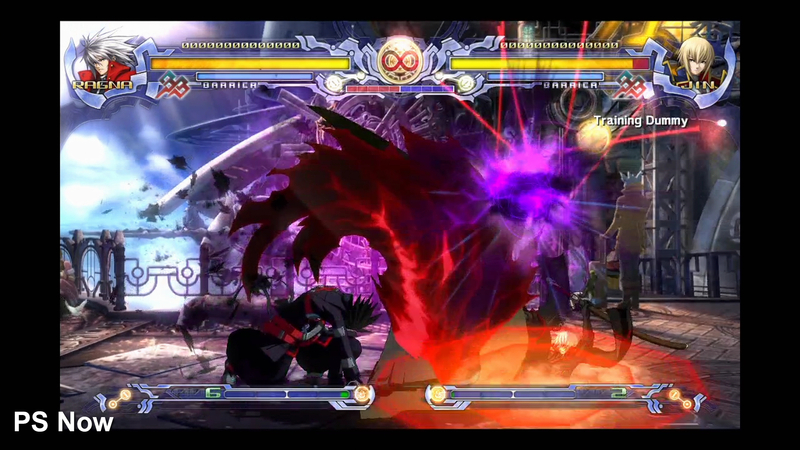 In effect, you get 60fps visuals with something approaching the input lag you get from a 30fps console experience. That's the theory at least - and based on what we've seen with GeForce Grid, that's definitely the most optimal route to cloud gaming actually becoming viable. Sony's approach is different. In using what is effectively standard PS3 hardware, PlayStation Now does not have access to that crucial latency saving - it needs to claw back the milliseconds elsewhere with customisations to the PS3 architecture (perhaps Sony has replaced the HDMI controller with a hardware h.264 video encoder) and savvy server placement to keep internet latency to a minimum. With no means to physically reduce input lag in the actual games, conventional wisdom suggests that the end result shouldn't work very well, but in many cases, PlayStation Now exceeds expectations and hands in a perfectly serviceable gaming experience: not as good as playing locally of course, but still enjoyable on a range of games. However, the quality of the experience depends heavily on a number of factors gamers may not be fully aware of: network conditions are crucial, for starters. There's also the choice of display too - a laggy screen can definitely impact the quality of the experience on many titles and can add almost as much latency as the streaming service itself. There's the sense that PlayStation Now perhaps pushes its luck in terms of acceptable lag on some titles, and external factors Sony has no control over could unduly impact the quality of the gameplay. But given the technological limitations Sony had to deal with, PlayStation Now is an impressive piece of tech - but latency concerns aside, whether a subscription/rental business model based around a catalogue of old games can gain traction in the light of OnLive's failure remains to be seen.